Note the word 'here' is a link! If you're a club administrator, as it says, click this link and you can log in to fix the problem! The system requires an ANNUAL payment of £50 to The Rotary Foundation. This money needs to be sent to RIBI and the club administrator needs to record when the next payment is due. The staff at RIBI can't do it, as they don't have access to the template. So, it relies on trust. Clubs are trusted to record this payment accurately. Click the 'here' link on the message. Click the 'club admin' link, as you normally would. Note there are links to where you can download the form (1) to accompany your payment AND to where you can update your 'renewal due' date (2). 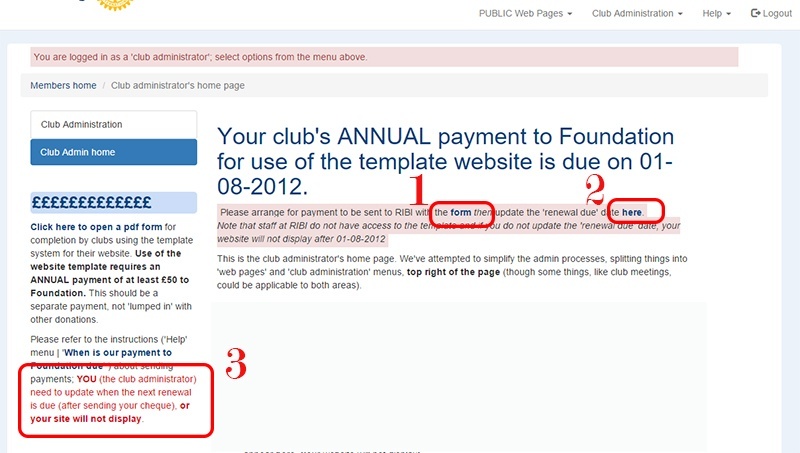 Note this should be done AFTER your club has sent its payment - just in case it's forgotten! The renewal due date is highlighted above. Note it must be the date when the next payment is due*, NOT the date when you send the payment! All you will probably need to do is change the year, e.g. 2015 to 2016, leaving everything else as it is. Make sure you click the 'update club details' button! Your site will now display. 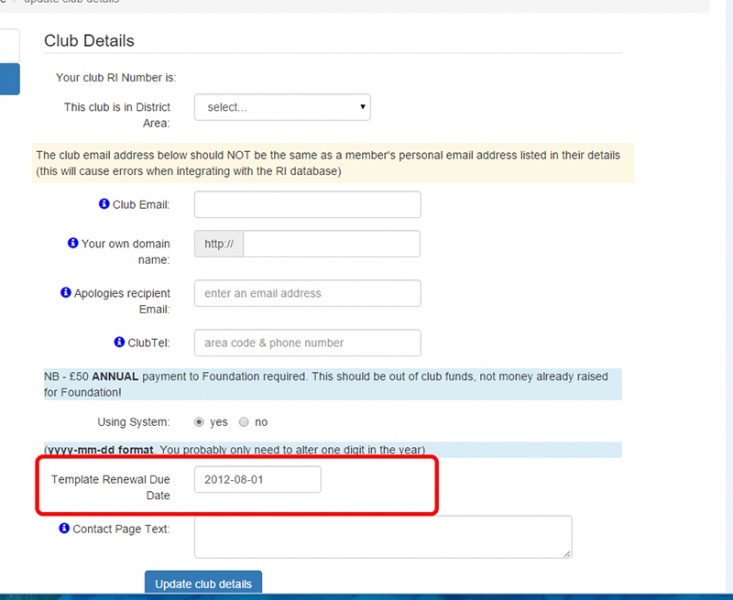 * this enables club administrators to receive reminder emails up to 3 months before renewal is due - if they act on these emails and update the 'renewal due date before expiry, the message at the top of this page will never be displayed.